Egypt's state news agency is reporting that the health of former president Hosni Mubarak has deteriorated and he has been transfered from prison to a military hospital. On a second night of protests at Tahrir square, thousands of demonstrators continue to chant against yesterday's verdict, which found the former President of Egypt get life imprisonment. Egypt's general prosecutor lodged an appeal against verdicts in the trial of former leader Hosni Mubarak, his sons and senior security officials, state television reported on Sunday. Nile News channel carried the prosecutor's decision in a short screen caption, without providing details. Egypt's Al-Ahram news website reports that dozens of young Egyptians stormed into the campaign headquarters of presidential candidate Ahmed Shafiq for the Fayoum area south of Cairo on Sunday. Tens of young Egyptians stormed into the headquarters of presidential candidate Ahmed Shafiq in Fayoum destroying all the contents of the headquarters including furniture and computer devices. It was the second attack on Shafiq's headquarters in few days. Reuters reports that the Egyptian youth have stormed into the campaign HQ of presidential candidate Ahmed Shafiq in Fayoum City, which is south of the country's capital Cairo. Egyptians continue to fill Tahir Square to protest against the verdicts delivered to ex-President Hosni Mubarak and his sons today. A judge verdict sentencing former Egyptian president Hosni Mubarak to life in prison and acquitting his sons and senior police officials from charges of corruption and killing protesters has triggered mass protests across Egypt, reuniting revolutionary forces in iconic Tahrir square. 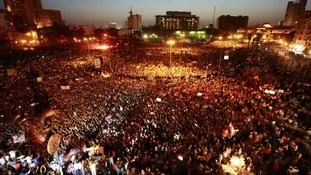 Reuters reported that protesters were chanting: "We are done with talk, we want an execution" at the square. Furious protesters hurled stones at the High Court headquarters in Cairo today, protesting against a verdict issued by an Egyptian judge against the ousted President Hosni Mubarak, who has been sentenced to life in prison.